Rockchip Batch Tool is a utility tool for Windows that lets you flash stock firmware on Rockchipset devices. Fuzhou Rockchip develops this tool and it, will let you flash IMG firmware on devices with the following Chipset: RK2919, RK3066, and RK3188. Here you can download all versions of Rockchip Batch Tool (old and new versions). 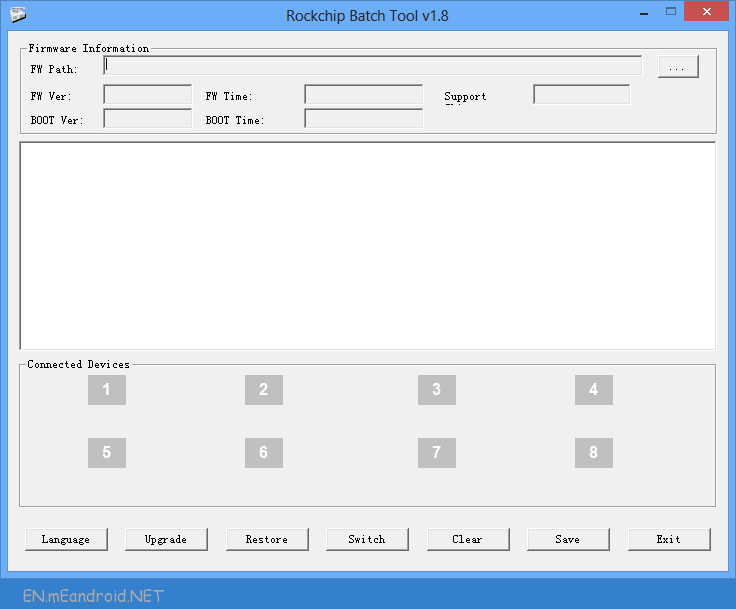 Download Rockchip Batch Tool from here, run it on your Windows computer and flash stock Android firmware on your device with Rockchipset. 1) Simple User Interface: The Rockchip Batch Tool user interface is pretty simple. Even if you are a newbie, you can easily use this tool to flash stock firmware to your Android smartphone or tablet. 2) Supports All Rockchipset Devices: If you own an Android device with any Rockchipset (RK2919, RK3066 or RK3188), then you can use this tool to flash IMG firmware on your device. 3) Supports All Windows Versions: You can run this tool on all Windows Operating System versions, i.e., Windows 10, Windows 8.1, Windows 8, Windows 7, Windows Vista and Windows XP. 4) Get Firmware Information: Once you load the firmware of your device in this tool, you will get the following information: Support Chip, Boot Time, Firmware Time, Firmware Version and Boot Version. 5) Support Multiple Device Upgrade: You can use Rockchip Batch Tool to flash the firmware on multiple devices simultaneously. All you have to do is connect multiple devices to your computer and let this tool to detect them. Once this tool detects your devices, you can upgrade the firmware of those devices simultaneously. [*] How to use RockChip Batch Tool: If you want to learn how to use RockChip Tool then head over to the How to Flash Android stock rom using RockChip Batch Tool Page. [*] RockChip allows you to flash firmware on RK2918 (RK29), RK3066 (RK30), RK3188 (RK31) Chipsets only. It doesnt support flashing firmware on other chipsets including the Allwinner Chipset. [*] Caution: During the Upgrade or restore, your personal data will be lost permanently. So, take a backup of your important data before performing the upgrade or restore process. [*] Credits: RockChip Tool is created by Fuzhou Rockchip Inc. So, full credits goes to them for creating the tool.